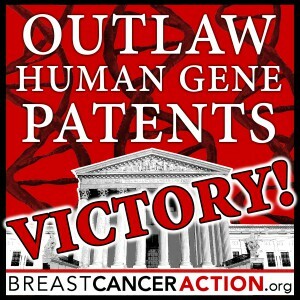 The Supreme Court has outlawed human gene patents. Corporations can no longer own our genes. Thank you for standing with us against corporate control of our health. Today, the Supreme Court ruled in our favor to strike down Myriad Genetics’ patents on the human “breast cancer” genes, BRCA1 and BRCA2—and not just Myriad’s patents, but patents on all human genes. This is a tremendous win for women’s health – and for all our health! What does today’s victory mean for women who have, or might have, an inherited risk of breast cancer? What does today’s victory mean for public health? Corporations can no longer own human genes! No single company can monopolize all research, testing, and treatment for diseases and disorders with a genetic link. While the Court ruled that genetic DNA is not patentable, the finding that complementary DNA (“cDNA”) may be patentable does not diminish the impact for patients. Laboratories can conduct genetic testing without using cDNA and this means that Myriad no longer holds a monopoly on the BRCA genes and all naturally occurring variations and mutations of these human genes. Since our founding, we’ve worked fearlessly to put patients before corporate profits. We are the only breast cancer organization that is a plaintiff in this case. We proudly joined researchers, genetic counselors, and individual patients in this landmark lawsuit, represented by the ACLU, because we couldn’t sit idly by while Myriad’s monopoly harmed women. Your support made this victory possible. Thank you for standing with us. 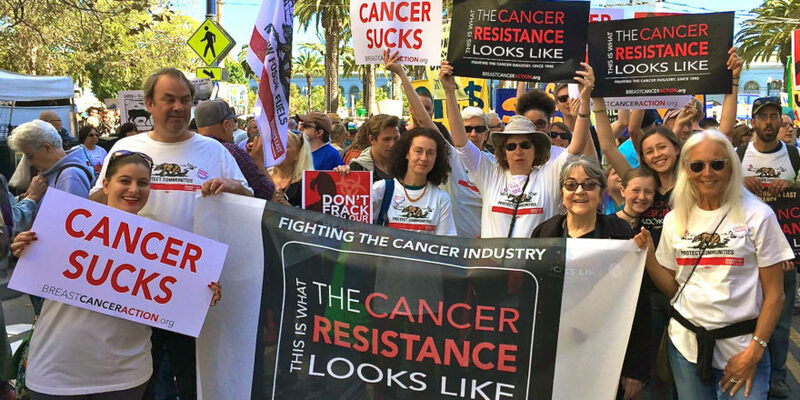 We can challenge corporate power and put people before profits because we’re not beholden to biotech or pharma funding – our funding, and our power to challenge the status quo, comes from you. We’re so proud to have supporters like you who continue to make wins for women’s health a reality. Please celebrate our win and affirm your support. Make a donation now. Today’s victory proves once again that when we work together, we can make a difference for women at risk of and living with breast cancer. Change happens when we join together to demand it – and with your support we will continue to demand better for women at risk of and living with breast cancer. Together we’ll continue to build a world that prioritizes women’s health over corporate profits.